Aquamoves receive Platinum Pool Award - Aquamoves – Indoor and outdoor pools, fitness facilities and programs in Shepparton, Victoria. Aquamoves Shepparton has been accredited with Life Saving Victoria’s (LSV’s) prized Platinum Pool award. In doing so, the facility joins an exclusive club of just 24 Victorian aquatic facilities currently holding the accreditation. Platinum Pool status is awarded to aquatic facilities providing outstanding levels of safety. To achieve the award Aquamoves had to undertake a rigorous series of assessments to ensure it met all of LSV’s criteria for the accreditation. LSV General Manager - Public Training and Pool Safety, Andy Dennis, said the award is a way of recognising those facilities that have attained the highest level of safety requirements and standards. “The award is similar to accrediting a lifesaver, and therefore facilities must undergo a thorough assessment of their skills and performance and attain a high standard throughout,” Mr Dennis said. “We are very selective when awarding Platinum Pool accreditation. LSV must be satisfied that exemplary levels of aquatic safety are being achieved and constantly maintained before the award is issued,” he said. Included in the award is an industry leading Pool Safety Assessment, a six-monthly assessment on implementation, Mystery Guest Visits and adherence to the best practice ‘Watch Around Water’ child supervision program. 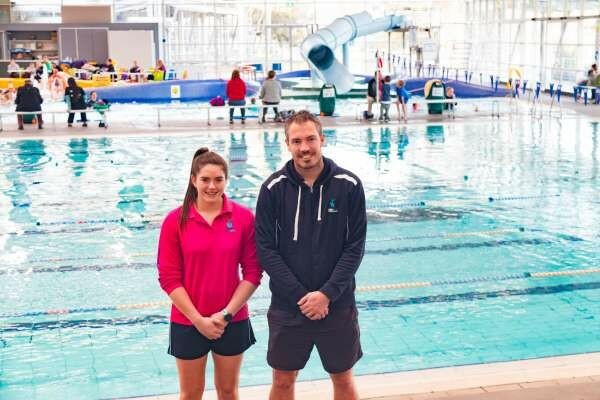 Greater Shepparton City Council Director Community, Kaye Thomson says Aquamoves’ achievement is made even more significant by being the only centre outside of metro Melbourne and Geelong to have ever been accredited with the award. “A rural centre achieving the required compliance score of 100 per cent is certainly industry leading and something that requires an exemplary commitment to staff training and a diligent adherence to operating procedures,” Ms Thomson said. Aquamoves' Pool Lifeguard Hayley Hogan and Operations Coordinator Sean Harrap.